These four agents, who spent most of their time with the Arab Section in Beirut, had families still in Syria or Yemen. Eventually, the war would become personal: “The lives of a million Jews in Muslim countries would be jeopardized by the establishment of a Jewish state.” This spurred a mass migration of Jews in Arab countries to Israel. “…Israel is more than one thing. It’s a refugee camp for the Jews of Europe. And it’s a minority insurrection inside the world of Islam.” While I got a sense of the individual men characterized, it took a while for the narrative to gain momentum. Otherwise, it gave me a new perspective into the earliest intelligence endeavors of the infant nation. Matti Friedman, author of the Aleppo Codex, has done it again. Another brillantly written book that reads like a spy novel. Much is witten about European Jews who immigrated to Israel in the 40's but very little is know about Jews who came from Arab lands and their contribution to the founding of the State of Israel. We learn about the original Israeli spy network and its founding with the British becasue of the alliance the Arab countries had with the Nazis. Friedman uses actual documentation f Matti Friedman, author of the Aleppo Codex, has done it again. Another brillantly written book that reads like a spy novel. Much is witten about European Jews who immigrated to Israel in the 40's but very little is know about Jews who came from Arab lands and their contribution to the founding of the State of Israel. We learn about the original Israeli spy network and its founding with the British becasue of the alliance the Arab countries had with the Nazis. Friedman uses actual documentation from young Arab Jews who were willing to risk their lives in order to have a better life in the new State of Israel. Most of them were born into poverty and the concept of a county where thery were not second class citizens became a reality. It was an interesting book. The book was written about the lives of 4 Israeli spies. Bur I would say that half or more than half of the book concerned the birth of the nation of Israeli 1948-49. And this was one of the problems of the book. A story would start about the exploits of one or more of the spies then it would discuss the political situation, then revert back to the story of the spies. I wish that the full story would be told continuously and either before or after cover the background It was an interesting book. The book was written about the lives of 4 Israeli spies. Bur I would say that half or more than half of the book concerned the birth of the nation of Israeli 1948-49. And this was one of the problems of the book. A story would start about the exploits of one or more of the spies then it would discuss the political situation, then revert back to the story of the spies. I wish that the full story would be told continuously and either before or after cover the background. The story of Hilter's Yacht was like this - should have been one chapter, yet it was covered in 2 chapters. I did learn some interesting things - Chapter 10 on Kim where the Arab Section was originally created to fight the Germans and not the British and the story about Hilter's Yacht in Chapters 15 and 16. I was sorry to learn about the 2 factions in Israel: those from Europe who were primirily secluar and those from the Middle East who were religious. And how those from the Middle East were marginalized. They were in it together and should have realized how much they needed each other. The author is writing an adult nonfiction book but it reads more like YA narrative nonfiction. That's not a bad thing, but I had to keep reminding myself that this was an adult book. What did annoy me more was the author's inserting himself into the story far too frequently, and some of the explanations of names could have been done in an author's note. This is also a very slim volume that attempts to both highlight the people involved in the Arab Section of the Palmach and what was going on pol The author is writing an adult nonfiction book but it reads more like YA narrative nonfiction. That's not a bad thing, but I had to keep reminding myself that this was an adult book. What did annoy me more was the author's inserting himself into the story far too frequently, and some of the explanations of names could have been done in an author's note. This is also a very slim volume that attempts to both highlight the people involved in the Arab Section of the Palmach and what was going on politically (and religiously) in what we now call Israel shortly before and after the country was founded. There is some discussion of the differences between the European Jews and those from the Middle East, as well as something about how the various Arab countries felt about what was happening due to the British pulling out but a fuller explanation might have helped those who don't really know about that era. In the spring of 1948 Israel and the Arab world are engaged in war. The British have recently pulled out. The Arab countries are aligning against the emerging state of Israel. European survivors are coming into the land of Israel. They are survivors hoping to build a Jewish homeland, in spite of the threats around them. It is a perilous time. What is needed is information. What is happening in the adjacent Arab nations? What is the political threat? Which leaders are the people rallying around? In the spring of 1948 Israel and the Arab world are engaged in war. The British have recently pulled out. The Arab countries are aligning against the emerging state of Israel. European survivors are coming into the land of Israel. They are survivors hoping to build a Jewish homeland, in spite of the threats around them. It is a perilous time. What is needed is information. What is happening in the adjacent Arab nations? What is the political threat? Which leaders are the people rallying around? Are there armaments? Where will they strike? How can Israel (with few resources) stop them? Matti Friedman researches the lives of four spies, who served the interests of Israel, through great hardship and danger to themselves. These were not European Jews, but Jews whose families lived among the Arabs. Nor were they professional spies. They were young men. They spoke Arabic, knew its dialects and knew their customs. They were driven to be part of a new Israel nation, even though the incoming European Jews were sometimes at odds with them. These spies had few resources or means of communications to headquarters for further instructions or insight. They were cut-off from family and friends, and each other. If caught, they would be executed. Eventually, men of this caliber would become an agency like the Mossad. Friedman gives voice to these men and tells their stories through documents, interviews and witnesses woven into a fascinating and harrowing story. He also explores the Middle Eastern roots of Israel society, which is so often depicted as a European formed country in the Western press/ histories. This is an essential book for all those interested in learning about the past and how it echoes down to issues in Israel today. Highly recommended. Friedman's meticulous research and passion for the subject are obvious throughout this book. As he tells the story of Israel's first spies, sent out before Israel was even officially a country, the reader learns about one of the fascinating episodes in Jewish history. Despite having never heard this story before and being a fan of historical nonfiction, this book just didn't grab me. I found myself interested enough each time I picked it up, but not interested enough to pick it up that often. I Friedman's meticulous research and passion for the subject are obvious throughout this book. As he tells the story of Israel's first spies, sent out before Israel was even officially a country, the reader learns about one of the fascinating episodes in Jewish history. Despite having never heard this story before and being a fan of historical nonfiction, this book just didn't grab me. I found myself interested enough each time I picked it up, but not interested enough to pick it up that often. I began it on December 8th and finished it on February 21st, during which time I finished 47 other books - this speaks volumes! The publisher's blurb makes it sound like this novel is full of intrigue and suspense, a lot like a Tom Clancy or Dale Brown novel. Sadly, though the intrigue, betrayal, and danger are all there - there just wasn't any suspense. I felt no emotion while reading this book. Sure, the facts were interesting enough and I continued reading, but the only compulsion I ever felt to pick the book back up was guilt because I accepted the book in exchange for providing a review. Honestly, had I not felt obligated to complete a review, I may not have finished the book. But, I contrast that with the fact that each time I did pick it up, I read without boredom. So, I'm giving this one 3 stars: 2 for the actual book itself and a bonus 1 for the obvious research that went into making sure it was an accurate portrayal of a story that really needs to be told. When Americans think of Israeli history, we fasten on a handful of names: Chaim Weizmann. David ben Gurion. Golda Meir. We think of kibbutzim, the Israeli Defense Force, the country's great universities, and its legal system. All these people, and many others whose names are prominent in the country's history, are of European origin. And every institution they created was a product of European thought and tradition. That simply reflects the fact that "in the 1940s, nine of every ten Jews in Pale When Americans think of Israeli history, we fasten on a handful of names: Chaim Weizmann. David ben Gurion. Golda Meir. We think of kibbutzim, the Israeli Defense Force, the country's great universities, and its legal system. All these people, and many others whose names are prominent in the country's history, are of European origin. And every institution they created was a product of European thought and tradition. That simply reflects the fact that "in the 1940s, nine of every ten Jews in Palestine came from Europe." Yet the persistent image of Israel today as a Western outpost in the Eastern Mediterranean is highly misleading. 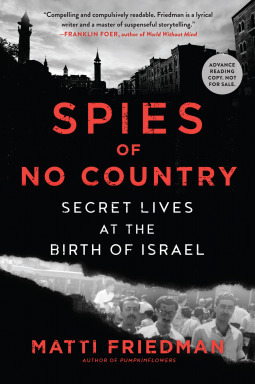 To understand how that changed and so deeply influences the nation's politics today, you can do no better than to read Israeli-Canadian journalist Matti Friedman's revealing new book, Spies of No Country. Friedman's book tells the tale of four young Arab-speaking Jewish men who became spies for the scattered forces working to establish the State of Israel. They had emigrated to join Jewish settlements in Palestine from their homes in Damascus, Aleppo, Arab-occupied Jerusalem, and Yemen. They were, in a word, Asian Jews, like millions of others who later fled the towns and cities of the Middle East and North Africa following Israel's declaration of independence in 1948. Though Friedman doesn't venture into Israeli political history, it's clear that long-neglected population rose into prominence in 1977 with the election of Menachem Begin. The country's rightward shift ever since then is one result. As Friedman points out, Asian Jews account today for half the country's population, and they tend to be poorer and less well educated than those of European descent. Prime Minister Benjamin Netanyahu's long term in office is only the most recent manifestation of the sea change they embody in the country's political orientation. "There was no state called Israel, nor did it seem likely there would be one." The four men who constitute Friedman's principal subject were among some ten Arab-speaking Jews recruited by the Palmach in the years leading up to the War of Independence. They were formed into an Arab Section that has received scant attention from historians. The men were sent, singly or in teams, to Beirut and other Arab capitals to gather intelligence, armed with their wits and only the most minimal training. "There was no state called Israel, nor did it seem likely there would be one. The United Nations had no way to enforce the partition plan" mandated by the General Assembly in November 1947. And war had immediately broken out following its passage. It's difficult to imagine how poorly trained and ill-equipped were the men of the Arab Section. As Friedman wrote, "there weren't any cars. At the time, the Arab Section didn't even own a radio. When they needed a camera for one surveillance mission . . . they'd had to borrow a Minox from a civilian they knew." And at first there was no money, either. "It wasn't just that the Palmach couldn't pay salaries. The unit couldn't always cover bus fare or a cheap plate of hummus for lunch, and on at least one occasion agents had to stop trailing a target because they didn't have money for a night in a hostel. "The men lived by their wits, acting on instinct that frequently led them to make mistakes. Yet they survived (unlike most of their fellows in the Arab Section), and they succeeded in feeding useful intelligence to their handlers in Palestine. "[A]fter hostilities began in 1948, the Section proved to be one of the only effective intelligence tools the Jews had." If you're spying for the CIA, you have Langley and the United States of America. You might not see them from your street corner or hotel room, but you know they exist, and their power is a comfort. These men had no such thing. They had no country – in early 1948, Israel was a wish, not a fact. If they disappeared, they'd be gone. No one might find them. No one might even look. The future was blank. And still they set out into those treacherous times, alone. This isn't a comprehensive history of the birth of Israel or Israeli intelligence, or even of the unit in question. It centers on a period of twenty pivotal months, from January 1948 through August of the following year; on two Levantine port cities eighty miles apart, Haifa and Beirut; and on four young people drawn from the margins of their society into the center of events. I was looking less for the sweep of history than for its human heart, and found it at these coordinates. There was no hero's welcome. There was no welcome at all, just a clerk's voucher for a night at an army hostel if he didn't have anywhere better to sleep. He didn't. He thought someone from the Palmac might be there to hear his stories, but there was no Palmac anymore. He was in the same city he'd left two years before on the bus with the refugees – and in a different city, with new people in the old homes. It was the same country he'd left in the chaos of the war, and a different one, where he'd never been. He was the same person and a different person. There were some themes that I wished Friedman had gone into deeper: the widespread fear of Jews trying to pass as natives in order to destabalise countries (Friedman mentions Moses and the Dreyfus Affair) and the irony of a ragtag cabal accomplishing the ruse. And I wish he had gone further into the idea that Zionism was a European idea (which was essentially communist and atheist) and that these architects of the Jewish homeland were dismayed and disgusted by the influx of Arabic Jews (“Israel is more than one thing. It's a refugee camp for the Jews of Europe. And it's a minority insurrection inside the world of Islam.”) And the natural fallout of this mass migration of the minorities into Israel: the cultural loss to communities with ancient Jewish Quarters now empty of Jews; the fact that it's so much easier to “other” people when you no longer live alongside them. These ideas are all mentioned in passing as integral to understanding modern Israel, and I would have liked more on them. Matti Friedman - Matti Friedman is an Israeli Canadian journalist and author. Friedman was born in Canada and grew up in Toronto. In 1995, he made aliyah to Israel and now he lives in Jerusalem. Between 2006 and the end of 2011, Friedman was a reporter and editor in the Jerusalem bureau of the Associated Press (AP) news agency. During his journalistic career, he also worked as a reporter in Egypt, Morocco, Lebanon, Moscow and Washington, D.C. Following the 2014 IsraelGaza conflict, Friedman wrote an essay criticizing what he views as the international media's bias against Israel and undue focus on the country, stating that news organizations treat it as "most important story on earth." He cited the fact that when he was a correspondent at the Associated Press (AP), "the agency had more than 40 staffers covering Israel and the Palestinian territories. That was significantly more news staff than the AP had in China, Russia, or India, or in all of the 50 countries of sub-Saharan Africa combined. It was higher than the total number of news-gathering employees in all the countries where the uprisings of the 'Arab Spring eventually erupted... I dont mean to pick on the APthe agency is wholly average, which makes it useful as an example. The big players in the news business practice groupthink, and these staffing arrangements were reflected across the herd." Israeli newspaper Haaretz reported that the piece went "viral" on Facebook. The Atlantic then invited Friedman to write a longer article. Friedman's first book, The Aleppo Codex: A True Story of Obsession, Faith and the Pursuit of an Ancient Bible, was published in May 2012 by Algonquin Books. The book is an account of how the Aleppo Codex, "the oldest, most complete, most accurate text of the Hebrew Bible," came to reside in Israel. It was believed the codex had been destroyed during the 1947 Anti-Jewish riots in Aleppo when the Central Synagogue of Aleppo, where the codex was housed, was set on fire and badly damaged. In the book, Friedman also investigates how and why many of the codex's pages went missing and what their fate might be. The book won the 2014 Sami Rohr Prize for Jewish Literature, was selected as one of Booklist's top ten religion and spirituality books of 2012, was awarded the American Library Association's 2013 Sophie Brody Medal and the 2013 Canadian Jewish Book Award for history, and received second place for the Religion Newswriters Association's 2013 nonfiction religion book of the year.